Raanjhanaa (transl. Beloved one) is a 2013 Indian Hindi-language romantic drama film directed by Aanand L. Rai and written by Himanshu Sharma. The film is produced by Krishika Lulla under the banner Eros International. It stars Dhanush, in his Bollywood debut, Sonam Kapoor and Abhay Deol in lead roles. The film was released on 21 June 2013 worldwide, while the dubbed Tamil version titled Ambikapathy was released a week later. The dialogues for the Tamil version were written by John Mahendran. The background score and songs were composed by A. R. Rahman. The Hindi lyrics of the tracks were penned by Irshad Kamil, whereas the Tamil lyrics were written by Vairamuthu. Within a week of release, the film's collections reached ₹34.9 crore (US$4.9 million) domestic nett. The film was declared a hit by Box Office India. Post four weeks of its run, the film grossed over ₹135 crore (US$19 million) worldwide. Kundan Shankar (Dhanush) is the only son of Tamil Hindu Brahmin parents settled in Varanasi. Since his childhood, Kundan has had a strong and obsessive one-sided love for Zoya (Sonam Kapoor), a Muslim girl residing in the other neighborhood, whom he had seen doing namaaz in his teacher's house while he went to collect chanda or donation for Hindu festival, Dussehra. He always attempts to flirt or be around Zoya but gets slapped several times in the process. These acts of courtship from him were being done even without knowing Zoya's name. Zoya finally reveals her name after repeated asking and starts to like him a bit because of Kundan's consistency of affection and tells him to meet at a place. When they meet, she comes to know that Kundan is a Hindu brahmin and starts to avoid again because her family is orthodox, and she is sure that they won't agree for any intimate relationship like marriage. Her family comes to know that Zoya is liking some Hindu guy, and they decide to send Zoya to Aligarh for further studies. After Zoya moves to College for further studies forcefully, Kundan tries to impress Zoya's family members by assisting them with small-small home chores. Zoya gets into Jawaharlal Nehru University, Delhi and discovers a long-lost strength as she confronts and then falls for student leader, Akram Zaidi (Abhay Deol). Kundan, however, only wants Zoya to forgive him. The Chief Minister tells Zoya that she must get revenge on Kundan. To get back Jasjeet's position, she tells Zoya to let Kundan get injured as he delivers his campaign speech. Zoya is apparently brainwashed by this plan and as the Chief Minister desired, Kundan is hurt badly and sent to ICU, thus fulfilling Zoya's revenge. At a press meet, the Chief Minister denies having any hand in the blast that hurt Kundan. However, Zoya steps forward and reveals that the plan was plotted by her and the Chief Minister and that she is prepared to go to prison for this. Zoya then finds out that Kundan was aware of the plot and still lets himself be injured. Shocked, she rushes to the hospital to be with him. Actor Dhanush plays the character Kundan who has a deep passion for his city Banaras and Zoya. It depicts him a young boy and a teen who turns into a sensitive adult. Sonam Kapoor quoted her character as, "'Zoya' is childlike and unpredictable. She can be cold and at the same time, objective. She has every quality that makes her desirable to a man." In an interview, Kapoor revealed that for playing the role of a school girl in the film, she drew inspiration from the character Jaya Bachchan played in the 1971 film Guddi. Actor Abhay Deol as Akram plays a secure yet confident university student, socialist and a budding politician. After main casting announcements, filming was substantially delayed; the reason was speculated to be composer A. R. Rahman's music being denied outright by the film director. Filming officially began in Varanasi, India in early September 2012 and continued for 40 days in and around the city. As per reports, the leading duo were also seen playing the role of 17-year-old teenagers. In mid-September 2012, the schedule of filming was put on hold as actor Dhanush fell ill on the sets in Varanasi. While filming in October 2012, the actor injured his shoulder during the filming of an action sequence for his Tamil outing Maryan. The consequences led to the scheduled shooting of dance sequences to be postponed and were shot in Varanasi on 19 December 2012. On 4 November 2012, Sonam Kapoor and Abhay Deol shot the song "Tu Mun Shudi" at India Gate, Delhi, and their dialogue scenes were shot at the Indian Institute of Mass Communication campus in Delhi by early December 2012. Permission to shoot inside was denied to the director by the college authorities. So, the unit shot some scenes in Amity International School, Noida. To avoid footage leaks, over a hundred potential crew members were made present at the filming venue. Certain filming was also done in Gurgaon and Faridabad. The title track of the film was shot on 27 December 2012. The final schedule of filming began in Delhi on 7 January 2013. In March 2013, the film's crew shot several scenes at the Pataudi Palace in Haryana over two days. After the completion of writing work, Actress Sonam Kapoor required the dialogue in Devnagri, hence "Sanjay Bhardwaj" (Dev) appointed to do the said job for her. The first look of the characters in the film was revealed as a poster with no credits and film name on the day of Holi 2013. The first theatrical trailer was released on 24 April 2013. The Hindi version of the film released worldwide on 21 June 2013 with the estimated number of release screens being 1,000. The film opened to an occupancy of 50–55%, the highest compared to other Bollywood films that released on the same date. Critic Komal Nahta responded positively and said, "On the whole, Raanjhanaa is an interesting, entertaining and a fairly different love story. It is like heady wine and its effect will only grow." Rajeev Masand of CNN-IBN wrote, "For its immensely entertaining first half, a winning score by AR Rahman, but most of all for Dhanush, this is a film that's worth your time. I'm going with three out of five for Raanjhanaa. It's not perfect, but it'll do." Resham Sengar of Zee News gave the film 4 out of 5 stars and summarised "Raanjhanaa is a love story that does not fall within the confines of a clichéd Bollywood romance." Taran Adarsh of Bollywood Hungama gave the film 3.5 out of 5 and stated, "On the whole, Raanjhanaa encompasses romance and myriad emotions most wonderfully, besides bravura performances and a popular musical score from the maestro." Adarsh also called it "a film that touches the core of your heart" and said it was "definitely worthy of a watch". At NDTV, Saibal Chatterjee gave it 3.5/5 and opined in the review, "The film defies the expectations of the audience at several crucial junctures and holds out absolutely no apologies for springing abrupt surprises. A love story with a huge difference that benefits no end from a clutch of exceptional performances." Sukanya Verma of Rediff Movies gave 3 out of 5 stars and claimed, "Raanjhanaa isn't easy viewing. Kundan and Zoya aren't easily likeable. They have flaws. They make mistakes. Blunders, really but Rai shows them for what they are; he never paints a pretty picture. And this brutal honesty coupled with a commanding Dhanush is what works." Meena Iyer of The Times of India claimed, "Raanjhanaa is a love story that has a Shakespearean touch and is mounted on a lavish scale". She noted, "You may not like this film if you cannot digest brooding love stories", and gave it 3.5 out of 5. Kaushik Rmesh of Planet Bollywood gave the film an 8 on 10 and summarised, "A realistic romance that brims with impressive elements (including and especially the enchanting music), Raanjhanaa is surely a winner at the end and must be watched for its unconventional handling and freshness". Nabanita of One India gave the film 3.5 out of 5 and wrote, "Raanjhanaa works, and yes, the movie has maximum possibilities to strike the right chords amongst the audience, only and only because of Dhanush and his heart-touching performance." Rachit Gupta of Filmfare called the film a "great love story" and concluded, "Grab a ticket, clutch the hand of your loved one and go fall in love. This time with great cinema". Critics at Indicine gave a score of 65 out of 100 and summarised, "The intentions of Aanand L Rai seem genuine. He wants to show us the world where he grew up in, wants to romanticize the feeling of nostalgia and unrequited love." Tushar Joshi writes for DNA India, "Raanjhanaa works because of Dhanush's ability to make you believe in his love for Zoya. You might not agree with his approach, but deep down you cheer and root for him each time Zoya plants a slap on his face." At Deccan Chronicle, Khalid Mohamed mentioned, "Raanjhanaa: Playing ping pong with love", and gave it three stars out of five. India Today rated the film 3/5 and judged, "Raanjhanaa harks back to the way Bollywood used to make love stories once upon a time. With some imagination, the effect would have been nostalgic, too." Shubha Shetty Saha of Mid-Day assigned 3.5/5 to the film and praised actor Dhanush and stated, "And then the second half is when the pace dips, the sincerity of the storyline gets somewhat hazy and the film gets wee bit disappointing. An absolutely believable one-sided romance takes a slightly deceptive political drama twist and I am not sure if that is what you wanted it to be. It is unpredictable, yes, but not in a great, believable way." At Mumbai Mirror, Karan Anshuman pointed, "Raanjhanaa flows like good poetry. It is arguably the best love story of the year so far, the kind of film others in the genre should aspire.". On the contrary to above, critic Mayank Shekhar wrote, "His (Dhanush) character is supposed to be gifted with great inter-personal skills. It doesn't quite show." Shubhra Gupta of The Indian Express gave it 2.5 out of 5 and mentioned, "Raanjhanaa is a film which is all of a piece in its engaging first half, and a good Bollywood launchpad for Dhanush. Makes me want to see what he will do in his second pass." At Emirates 24/7, Sneha May Francis said, "While music maestro AR Rahman tunes the track, and leaves us occasionally cheerful, the moments are far too few to erase the horrid after effects of this movie." 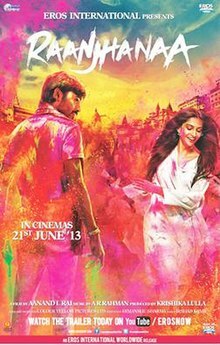 Critic Manohar Basu at Koimoi stated, "However a sluggish screenplay and lurching script makes Raanjhanaa a half baked effort and hence gets a 3/5 from me." Sudhish Kamath of The Hindu concluded, "A dream debut for Dhanush even if the film gets stuck in its messy political subtext that kills the romance." At The Hollywood Reporter, Lisa Tsering left the film unrated and asserted, "The fact that the film marks the Hindi-language debut of South Indian star and YouTube superstar Dhanush is bound to draw interest at the box office, though Rai's firm refusal to play by the rules of the typical Bollywood love story may make it hard to sustain momentum." The Central Board of Film Censors (CFBC) banned the film before its scheduled release in Pakistan. Chief executive officer of IMGC Global Entertainment Amjad Rasheed, the importer of Raanjhanaa, revealed that he received a letter from the CBFC with directives to shelve the film's release which stated that the film portrays an inapt image of a Muslim girl (played by Sonam Kapoor) falling in love with a Hindu man and having an affair with him. The first-day collection was estimated at ₹81.5 million (US$1.1 million). The film performed well at multiplexes outside the metros in places like Indore, Kanpur, Banaras, regions of CP Berar, Central India and states like Uttar Pradesh, Bihar and Rajasthan. On its opening day, it grossed more than 500,000 in the city of Lucknow itself. On Saturday, a day just after release, collections rose to ₹68.0 million (US$950,000). The film had a growth rate of 40–45%, making its total first weekend collection ₹201 million (US$2.8 million). Within a week of its release, its gross surpassed ₹340 million (US$4.7 million) and Box Office India declared it a "Hit". After two weeks of release, the film had collected ₹520 million (US$7.2 million) at the box office. Raanjhanaa also had the fourth-highest second week collections of the year 2013. It grossed Rs 75 million in its third week, taking its total domestic overall collections to ₹600 million (US$8.3 million) and worldwide collections nearing to a remarkable mark and becoming the second highest-grosser of 2013 at the time of its release. The film ended its run with an estimated ₹915 million (US$13 million). Raanjhanaa grossed around ₹15.0 million (US$210,000) internationally on its first weekend. Its first weekend gross in the United Kingdom amounted to £72,000, while in North America it made $415,000. The film collected $145,000 in the UAE and $46,000 in Australia. Raanjhanaa also grossed $1.55 million in ten days. Further, the film receded its total collections and dropped around $1.8 million by 17 July 2013. Note – The lists are ordered by the date of announcement, not necessarily by the date of ceremony/telecast. ^ Dibyojyoti Baksi. "Jaya Bachchan's performance in Guddi inspired me: Sonam Kapoor". Hindustan Times. Retrieved 1 March 2013. ^ a b "'Ambikapathy' release postponed". Sify. 14 June 2013. Retrieved 14 June 2013. ^ a b c "Raanjhanaa - Movie - Box Office India". Retrieved 19 November 2016. ^ "Dhanush to romance Sonam Kapoor". One India Entertainment. 5 March 2012. Retrieved 20 September 2012. ^ a b "It is raining in Dhanush's heart thanks to A.R. Rahman". Behindwoods. 27 December 2012. Retrieved 27 December 2012. ^ "Raanjhanaa becomes Ambikapathy in Tamil". Times of India. Retrieved 9 May 2013. ^ "RAANJHANAA Crosses 34 Cr Nett In Six Days". Box Office Capsule. Retrieved 28 June 2013. ^ a b "Raanjhanaa Is A HIT". Box Office India. Retrieved 28 June 2013. ^ "RAANJHANAA Crosses 62 Cr Nett In 4th Week". Box Office Capsule. Retrieved 8 July 2013. ^ Suanshu Khurana (10 July 2013). "Being the Change". the Indian Express. Retrieved 11 July 2013. ^ "Dhanush signed for Hindi film 'Raanjhnaa'". IBN Live. 24 January 2012. Retrieved 20 September 2012. ^ "Will Sonam Kapoor have the dates for Dhanush?". Times of India. 7 March 2012. Retrieved 7 June 2012. ^ "Sonam Kapoor braves Delhi's heat!". Times of India. 8 April 2012. Retrieved 21 June 2013. ^ Subhash K Jha (27 August 2012). "Sonam, Dhanush to play younger lovers in 'Raanjhnaa'". Times of India. Retrieved 20 September 2012. ^ Tejashree Bhopatkar (14 September 2012). "Urmila Sharma to share screen space with Dhanush". Times of India. Retrieved 20 September 2012. ^ Kunal M Shah (26 September 2012). "Real reason behind Aditi Rao's exit from 'Raanjhnaa'". Mid-Day. Retrieved 4 October 2012. ^ "'Guddi' inspired Sonam for 'Raanjhanaa'". Times of India. 25 May 2013. Retrieved 26 May 2013. ^ Parag Maniar (18 June 2013). "'Raanjhanaa': A tale of undying love". Times of India. Retrieved 18 June 2013. ^ Jyothi Prabhakar (4 July 2012). "Rahman not behind my film's delay, says Anand Rai". Times of India. Retrieved 20 September 2012. ^ "First Look: Sonam Kapoor, Dhanush turn school kids for 'Raanjhanaa'". IBN Live. 7 September 2012. Retrieved 20 September 2012. ^ "Dhanush under the weather". Behindwoods. 19 September 2012. Retrieved 20 September 2012. ^ "Sonam, Abhay shoots for Raanjhnaa in Delhi". Times of India. 19 December 2012. Retrieved 22 December 2012. ^ Subhash K Jha (for Mumbai Mirror) (25 October 2012). "Dhanush stalls 'Raanjhnaa' shoot". Times of India. Retrieved 27 October 2012. ^ Ranjit Kumar (4 November 2012). "Sonam, Abhay shoots for Raanjhnaa in Delhi". Times of India. Retrieved 22 December 2012. ^ "Sonam, Abhay shoot for 'Raanjhnaa' in Delhi". Zee News. 16 November 2012. Retrieved 11 December 2012. ^ Shiva Prasad (8 January 2013). "Dhanush freezes in Delhi for Raanjhnaa". Times of India. Retrieved 8 January 2013. ^ Dibyojyoti Baksi (14 March 2013). "Sonam Kapoor's Raanjhana to be shot in Pataudi palace". Hindustan Times. Retrieved 19 April 2013. ^ Nirmika Singh (28 September 2012). "I never miss an opportunity to make music: AR Rahman". Hindustan Times. Archived from the original on 29 September 2012. Retrieved 28 September 2012. ^ Nirmika Singh (27 May 2013). "It is good time to be part of the industry: A R Rahman". Hindustan Times. Retrieved 27 May 2013. ^ "Sony Music, EROS Int'l come together for music of Raanjhanaa". CNBC-TV18. Retrieved 29 April 2013. ^ "Sonam, Dhanush promote Raanjhanaa in Mumbai". India TV. 11 May 2013. Retrieved 26 May 2013. ^ "Dhanush hopes to get recognised as an actor after Raanjhanaa". The Indian Express. 14 June 2013. Retrieved 17 June 2013. ^ "Working their charm on Chennai". Rediff. 21 June 2013. Retrieved 22 June 2013. ^ "Raanjhanaa – TOI Film Profile". The Times of India. 22 April 2013. Retrieved 23 April 2013. ^ a b Joginder Tuteja (23 April 2013). "Raanjhanaa's real romance". The Asian Age. Retrieved 23 April 2013. ^ "A midnight release for Dhanush". Behindwoods. 22 April 2013. Retrieved 23 April 2013. ^ "Shorcut Romeo And Enemmy Dull Raanjhanaa Better But Low". Box Office India. 21 June 2013. Retrieved 21 June 2013. ^ "Bleeding heart". rajeevmasand.com. 21 June 2013. Retrieved 21 June 2013. ^ "'Raanjhanaa' review: Here arrives a romantic hero of a rare breed – Dhanush!". Zee News. 21 June 2013. Retrieved 21 June 2013. ^ "Raanjhanaa". Bollywood Hungama. 20 June 2013. Retrieved 21 June 2013. ^ "Raanjhanaa movie review". NDTV. 21 June 2013. Retrieved 21 June 2013. ^ "Review: Raanjhanaa shines with Dhanush and Rahman's score". Rediff. 21 June 2013. Retrieved 21 June 2013. ^ "Raanjhanna". The Times of India. 21 June 2013. Retrieved 21 June 2013. ^ "Raanjhanaa Movie Review: Dhanush gets his Hindi right". One India. 20 June 2013. Retrieved 21 June 2013. ^ "Raanjhanaa Movie Review". 21 June 2013. Retrieved 23 June 2013. ^ a b "Raanjhanaa Review". Indicine. 21 June 2013. Retrieved 21 June 2013. ^ a b "Critics' review Raanjhanaa: watch it for performances, first half". Hindustan Times. 21 June 2013. Retrieved 21 June 2013. ^ "Raanjhanaa: Playing ping pong with love". Deccan Chronicle. 21 June 2013. Retrieved 21 June 2013. ^ " "Raanjhanaa Review". India Today. 21 June 2013. Retrieved 21 June 2013. ^ "Raanjhanaa : Film Review". Mumbai Mirror. 21 June 2013. Retrieved 21 June 2013. ^ "Raanjhanaa Review". The Indian Express. 21 June 2013. Retrieved 21 June 2013. ^ "Review: Dhanush's Bollywood take-off 'Raanjhanaa' is a terribly one-sided affair". Emirates 24/7. 20 June 2013. Retrieved 21 June 2013. ^ "Raanjhanaa Review". koimoi.com. 20 June 2013. Retrieved 21 June 2013. ^ "Raanjhanaa: Between the head and the heart". The Hindu. 22 June 2013. Retrieved 22 June 2013. ^ "Raanjhanaa: Film Review". The Hollywood Reporter. 21 June 2013. Retrieved 22 June 2013. ^ "Pakistan Film Censor Board has banned "Raanjhanaa"". The Times of India. 4 July 2013. Retrieved 4 July 2013. ^ "Raanjhanaa Picks Up And Heads for a Decent First Day". Box Office India. Retrieved 22 June 2013. ^ "Raanjhanaa Picks Up Fukrey Excellent 8th Day". Box Office India. Retrieved 22 June 2013. ^ "Shortcut Romeo Is Mega Disaster". Box Office India. Retrieved 22 June 2013. ^ "Ranjhanaa Has Good Growth on Saturday". Box Office India. Retrieved 23 June 2013. ^ a b "RAANJHANAA Finishes Weekend Big". Box Office Capsule. Retrieved 23 June 2013. ^ "Lootera and Policegiri Make Little Impact Raanjhanaa Strong Second Week". Box Office India. Retrieved 6 July 2013. ^ "Top Second Week Collections 2013: RAANJHANAA FOURTH". Box Office India. Retrieved 6 July 2013. ^ "Raanjhanaa Hits 60 crores in Three Weeks". Box Office India. Retrieved 12 July 2013. ^ "Will Chennai Express Beat Ek Tha Tiger Opening Records?". Box Office India. Retrieved 9 August 2013. ^ "Raanjhanaa Does Well in USA Yeh Jawaani Hai Deewani At $9.50 Million". =Box Office India. Retrieved 26 June 2013. ^ "Big Star Entertainment Award 2013". The Filmy Guide. Retrieved 1 January 2014. ^ "20th Annual Screen Awards 2014: The complete list of nominees". IBN Live. Retrieved 14 January 2014. ^ "Screen Awards 2014 Winners – Full List". Indicine. Retrieved 14 January 2014. ^ "Nominations for Renault Star Guild Awards 2014". 16 January 2014. ^ "Full Winners List of Bollywood Business Awards 2013". 22 January 2014. ^ "Filmfare Awards 2014: List of winners". NDTV. 25 January 2014.